The LocalDateTime class has introduced in Java 8 to represents both date and time value. It's local, so date and time are always in your local time zone. Since the java.util.Date has been widely used everywhere in many Java applications, you will often find yourself converting java.util.Date to LocalDate, LocalTime and LocalDateTime classes of the java.time package. Earlier I have shown you how to convert Date to LocalDate and today, I am going to teach you how to convert Date to LocalDateTime in Java 8. The approach is the same. Since the equivalent class of java.util.Date in new Date and Time API is java.time.Instant, we first convert Date to Instance and then create LocalDateTime instance from that Instant using System's default timezone. JDK 8 has added convenient toInstant() method on java.util.Date to interface old date and time API with a new one. The key detail to note here is that the java.util.Date is not exactly the date but an instance of time (milliseconds passed from Epoch) and that's why it equates to an instance of the java.time.Instant object. Another important thing to remember is that an Instant also does not contain any information about the time-zone. Thus, to create a DateTime object from Instant, it is necessary to specify a timezone. For LocalDateTime, this should be the default zone provided by ZoneId.systemDefault() method. If your application control timezone than you can use that here as well. The LocalDateTime class has a convenient factory method. LocalDateTime.ofInstant(), which takes both the instant and time zone. If you are curious about important Java 8 features, you can also join The Complete Java MasterClass course on Udemy to learn more about key concepts of new Date and time API. It's one of the best course to learn Java and also most up-to-date, recently updated for Java 11 version. Create LocalDateTime using factory method ofInstant() by using System's default timezone. Here is how you can convert java.util.Date to java.time.LocalDateTime in Java 8 with two lines of code. Now, if you want to convert the LocalDateTime back to java.util.Date, you need to go via ZonedDateTime class, which represents date and time value with time zone. If you want to learn new Date and Time API from start to end, just join the What's New in Java 8 course on Pluarlsight. One of the best course to learn new features of Java 8, including lambdas, streams, concurrency enhancement and other worth noting features. Now that we know the concept behind Date and LocalDateTime classes and steps to convert java.util.Date to java.time.LocalDateTime, let's see a complete working program to understand the idea better. In this program, I have converted the current value of Date to equivalent LocalDateTime value in Java 8. * API is not LocalDateTime but the Instant. Note that the conversion from LocalDateTime to ZonedDateTime has the potential to introduce unexpected behavior. This is because not every local date-time exists due to Daylight Saving Time. In autumn/fall, there is an overlap in the local time-line where the same local date-time occurs twice. In spring, there is a gap, where an hour disappears. See the Javadoc of atZone(ZoneId) for more the definition of what the conversion will do. Similarly, if you convert a java.util.Date to a LocalDateTime and back to a java.util.Date, you may end up with a different instant due to Daylight Saving Time. 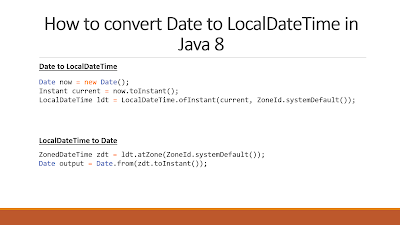 That's all about how to convert LocalDateTime to Date in Java 8 and vice-versa. Just remember that Date doesn't have any timezone information. It just holds milliseconds from Epoch in a long variable. It's the toString() method of Date which prints the Date value in the local timezone. That's why you need a time zone to convert the Date value to LocalDateTime or ZonedDateTime. Thanks for reading this article so far. If you like this Java 8 tutorial then please share with your friends and colleagues. If you have any questions or feedback, then please drop a comment.